A typical moving day is equal parts excitement and trepidation. You just want this whole process to be over with and not have any damage caused to your stuff. You also want to look beyond the unpacking of all the boxes and being settled into your new living space. Once that has been accomplished you wonder what all the fuss was about. There are some moving day tips that can help you make for a smooth operation. First of all, you want to do whatever you can to avoid confusion on moving day. Hopefully you will label all your boxes properly to let the movers know where they belong. You should also make corresponding signs or labels of the doors of your new home. Sure the movers will know exactly where the kitchen is but will they really be able to tell the master bedroom from the guest bedroom from the office? If that’s where you want your boxes to go then just take a note to the doors to let them know the right space. When it comes to your big pieces of furniture you should already have a plan laid out for just how you want them to be placed. You could try this with a floor plan you sketch out that you can share with the movers so they know exactly where you want things to go. And yes you’re well within your rights to change your mind once you see the furniture in the space! The next tip to keep in mind is to make sure you’re covered on both ends of the move. 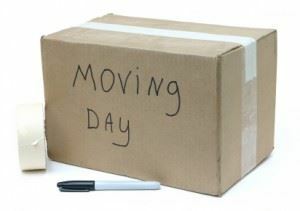 If you’re having movers pack up your house you want to make sure you or someone you trust is there to supervise the action. And you should wait until the last item is on the truck before you head over to the new house. If you are watching everything leave your home and go on to the truck there should be no question of a lost or damaged item. If you are bypassing professional movers and calling on friends to pitch in make sure you are just as organize for them as you would be with the professional movers. Your friends shouldn’t be packing boxes for you; that should be done well in advance. And make sure you’ve got plenty of cool drinks and snacks standing by to take care of your friends. A well fed group is a happy group. Also, if you have a dog or young kid moving day is the perfect time to find a sitter for both of them. You don’t want to worry about either one of them getting trampled on. Finally the best advice for a smooth moving day is not to move any of your old junk with you. This should mean setting up a junk moving day separate from the big move. On this day you can hire a junk hauling crew like Junk King to take away all that stuff you’ve discovered you don’t need any more. If you’re getting it fresh start with a new place you don’t want filled with old junk. This entry was posted in Alameda Hauling, East Bay Junk Removal, Moving and tagged Alameda Junk Hauling, East Bay Moving, Moving on July 26, 2011 by Junk King. Last updated August 4, 2017 .